Washington D.C. – Rep. Jackie Walorski (IN-02), a member of the House and Senate Veterans’ Affairs Conference Committee, tonight signed bipartisan legislation to reform the Department of Veterans Affairs (VA) and overhaul the mismanagement that jeopardized the health of veterans across the country. The bill now heads to both the full House and Senate for further consideration. 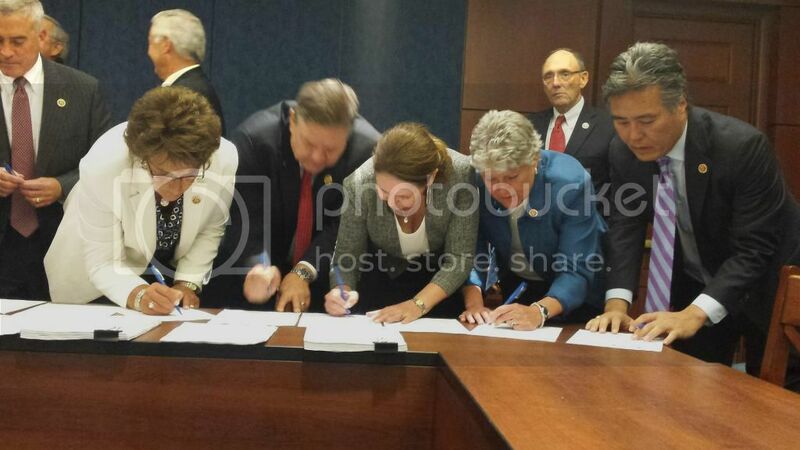 Rep. Jackie Walorski (IN-02), member of the Veterans’ Affairs Conference Committee, signs the bipartisan agreement reached by the conferees today. L to R: Rep. Jackie Walorski (IN-02), Dr. Dan Benishek (MI-01), Rep. Ann Kirkpatrick (AZ-01), Rep. Julia Brownley (CA-26), Rep. Mark Takano (CA-41). In order to conclude its business, a majority of both House and Senate delegations to the conference must indicate their approval by signing the conference report. If both the House and Senate pass the measure, it will head to the president’s desk for his signature into law. Last week, Walorski urged her fellow conferees to continue their bipartisan cooperation in passing a bill to reform the VA.
Walorski co-sponsored H.R. 4031 and H.R. 4810 in the House of Representatives to address widespread problems currently plaguing the VA.